SALT LAKE CITY - Sept. 29, 2016 - PRLog -- It's that time again! Holidays are fast approaching, making this the perfect time to start exercising regularly so you can thoroughly enjoy the holiday treats to come. Kazzo Fitness is helping you get started on these fitness goals with a generous FLASH deal offering Premium extra-durable gym balls with a high star rating on Amazon.com for a whopping 70% off the MSRP of $34.95. Early customers can get the extra-thick anti-burst ball for just $13.77. To take advantage of the deal, consumers visit Amazon.com and search for Kazzo Fitness ball. The 5-star rated ball will appear and discount is automatically applied until supplies run out. 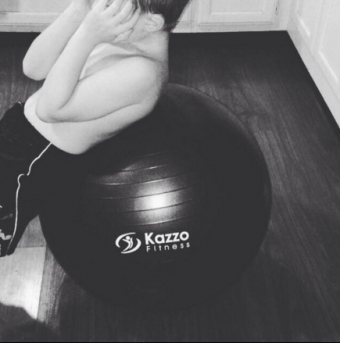 The exercise ball offers consumers extra-thick walls for maximum support and resistance, in addition to an anti-slip texture and non-toxic PVC material. "I have owned, and currently own, several stability balls. My family loves to exercise together in our home gym. So, we have different sized balls from different companies that we have accumulated over the years. The Kazzo Fitness Ball is arguably the best one. It just looks and feels great. It has a sleek-looking surface with an anti-slip texture. The material is clearly thicker than other balls on the market" says Kazzo Fitness customer Roger M, in a recent Amazon review. Another customer stated, "Had a few friends over and they tried to do the ab-shred test. One friend weighs 212lb and it held up fine. I have to admit I was worried it would burst. He even sat on most of the night. It's a great product, the company seems to be authentic, there's no racket, accountable and has a winning formula. I did my research and found other companies offering exercise balls, offering a misleading-false, impact training workout offer, which seemed like a scam." Loch Ness Monster Is a Real Thing? !